Dato’ Sri Amrin Awaluddin is currently the Group Managing Director at Sime Darby Property. Dato’ Sri Amrin began his career in 1989 in the financiaI services industry with BBMB Discount House Berhad as a money market dealer before joining Development and Commercial Bank Berhad in 1990 as an officer handling corporate and commercial loans transactions. He later joined Amanah Merchant Bank Berhad in 1990 and he served the financial institution in the position of Manager of the Structured and Project Finance Division before leaving the organisation in 1996. He joined Renong Berhad as Senior General Manager in 1996 and subsequently left to join Malaysian Resources Corporation Berhad as Head of Corporate Finance in 1999 where he served the company in this position until 2000. 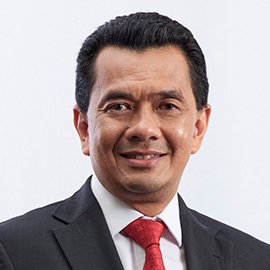 In 2001, he was appointed as Chief Operation Officer of Putra Capital Berhad before he joined the Media Prima Berhad group of companies (“Media Prima Group”) in the same year. Dato’ Sri Amrin joined as the CFO of Sistem Televisyen Malaysia Berhad (TV3) (“STMB”) in 2001. His main responsibility was to restructure and turnaround STMB and The New Straits Times Press (Malaysia) Berhad (“NSTP”). Following the successful restructuring of the former media assets of Malaysian Resources Corporation Berhad, Media Prima Berhad was established in year 2003 and he was appointed as Group CFO. He played a pivotal role in transforming the Media Prima Group into an integrated media group. He assumed the position of CEO of Natseven TV Sdn Bhd (ntv7) in 2006 and then as the CEO of STMB in 2008. In 2009, he was appointed as the Group Managing Director of Media Prima Berhad and he was then redesignated to the position of Executive Director of Media Prima Berhad on 1 August 2017. Dato’ Sri Amrin sits on the board of directors of Media Prima Berhad and its subsidiaries amongst them NSTP, STMB, Synchrosound Studio Sdn Bhd, Big Tree Outdoor Sdn Bhd, Primeworks Studios Sdn Bhd and Media Prima Digital Sdn Bhd. He is also an Independent Non-Executive Director of Taliworks Corporation Berhad and CIMB Bank Berhad. He is the Deputy President of Kuala Lumpur Business Club (KLBC), a Member of the Board of Trustees of Enactus Education Foundation and Ahli Lembaga Pengurus Tabung Amanah Perwira dan Pertahanan Negara (TAPPN). Dato’ Sri Amrin holds a Bachelor of Business Administration (Honours) from the Acadia University, Canada in 1989 and subsequently, a Master of Business Administration (Finance) with Distinction from University of Hull, United Kingdom in 1994. He is a member of the Chartered Institute of Management Accountants, United Kingdom (CIMA) and a Chartered Accountant of the Malaysian Institute of Accountants since 2016.